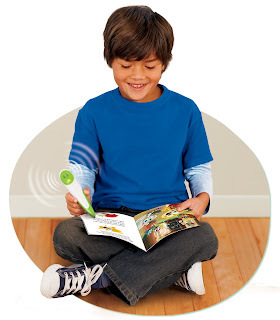 Magic-ray-emitting device allows your kid to do yogic levitation! And look how happy it will make him! Apparently March is something called National Reading Month. Like, the weather is still crappy, you are sick of all the stupid shows on TV by now and you cannot afford to raise your thermostat so you are trapped in your Snuggie. So, why not read? But one of you lucky devils won't need that coupon. Cause if you leave a comment here telling me how many minutes you pledged to read to or with your little ones, and if I randomly pick your name, LeapFrog will send you a Tag reading system AND 5 BOOKS for free! And that's not all! They'll also give you a "an expanded-memory LeapFrog School Tag reader + 10 books (chosen by LeapFrog) to donate to (your) local library." OK, personally I am very lazy and think LeapFrog would be crazy to entrust me with a donation for my local library. It would probably sit in the back of my car for months until someone spilled their sippy cup on it. But not you! You love your local library and are on the ball! You are all winners! OK, only one of you is a winner. Leave your comments here, and I'll let you know who you are at the end of March. * This totally reminds me of an "I was such a precocious child" story. This one time we did one of those reading charts at school where we were supposed to write down how many minutes or hours we read each night. Well, I liked to read a lot, and didn't always do my homework, had little to no social life, so ... since I was participating in this program I decided to read a little more than usual. I went home after school and read from about 3 p.m. until dinner at 6. Then I went back to my room and read from 7 to 9:30, and went to bed. But when I put a week of 5-1/2 hours each day on my chart, my teacher convinced me that I just did not know how to do math because no one could possibly read that much. Dear whatever teacher you were: I sure hope my daughters do not meet any teachers like you, because they do not need anyone telling them they cannot do math. As far as reading goes, say whatever you want, because I doubt you'll be able to put them off that. Oh yeah -- I'm also giving away another Tag on my other blog. You can enter on both sites, but you can only win once. Reading is definitely a huge priority in our house. My 2yo has me read to him at least a total of an hour every day... We're overachievers like you. :) So I chose the 30-minute pledge. But anyway I would love to have this system... I've heard good things too. So I hope I win, even though first comments never seem to. We pledged to read 30 minutes a day, 15 hours a week! We love reading, so this is great! I think we are ready to move to the next step, and have my daughter start to read now! haha! Thanks for the giveaway! I pledged 20. My daughter is slightly younger than Pebbles and its hard to get her to sit down for very long :) The library is such a great place, we get new books every week. Thanks for all the great tips over on SWP. I love reading your blog and a big congrats on the new baby being a boy! I pledge 30 minutes a day. We love reading together. Thanks! I came over from your other blog for another chance to win. I never knew you ahd another blog, how cool! I pledge to read 20 minutes to my four boys! Thank you for this second chance to win this. I could really use this, I think it could really help my son with his reading. Thanks again!! I pledged 30 minutes a day. Hmm... I pledged 20 mins a day only to realize that the offer is valid only in the US and not in Canada. Oh well, I'll still read to my son for 20 minutes a day anyway.. Here I am trying to win again...and I RANDOMLY came upon blog #2!! Wow...it is 30 mins for me! I pledged 10 minutes and I was concentrating SO hard on being funny in my comment on your other blog I forgot to put that, but if I put another comment then that gives me another entry and that's kinda like cheating and I don't want to cheat so I'm writing it over her and hope you read both of them and thanks for having this giveaway and for letting me put run-on sentences on your blog. Okay, even though this makes me sound like a loser, it doesn't mean I don't need to win a contest and boost my self-esteem. i pledged 10 min with Liam... i love story time with my little man! Awesome Giveaway! I pledge to read to my son 10 minutes a day - he is only 25 months and doesn't sit too well for books just yet. I think this Leapfrog set would be perfect for him starting out! I am such a big book reader and I hope my kids grow up to be book lovers! Oh and I visit my Chicago Public Library once a week so that wouldn't be a problem! I hope I win! I love leap frog items! I pledge 25 minutes! we also pledged 30 minutes a day, which for our family is easy peasy:) my almost 3 yr old is constantly asking us to read to her and i love it! thanks! I pledged 20 minutes a day with my son and I am pretty sure we´ll reach it. His older sisters need to be dragged from their books for meals but he is a little less interested (he´s only three.) Maybe these cool books could pique his interest. i pledge to read to my son 30 minutes a day - although it's usually about double that! We love books! I pledged to read 20 minutes to my son every day. My daughters would love this. Our library already has one but will only 1 book and it gets old fast. I pledge 30 minutes per day per daughter. They don't like to share a book, always have to have their own. Thanks for your blog. I pledgeed to read to my 3 month old 30 minutes a day. I am n elementary school teacher and I have witnessed a love for reading with my students and want to be sure my son receives the same gift. I read to him now and he just checks out the pictures. I hope it is the beginning of an enjoyment of reading for him. I pledged 20 minutes of reading with my older two chidren! We already read throughout the day... but I'd LOVe to establish a solid 20 minutes of JUST reading! I pledge 30 mins per day. We do more cause my kids are homeschooled are we are always reading. Wonderful giveaway thanks so much. OMG! You are so funny! I LOL'd while reading your post! Seriously - I'm likely to have the library donation sitting in my car for quite a while too. But if I do win I will definitely get it there . . . eventually (you know, when the weather is nice and the kids are cooperating and all that jazz). Oh, that sounds like fun. Is it too late to pledge? I pledge 5 minutes a day... it's not much but the Bean is only 5 months. Thanks Carrie! i pledged 10 minutes for my oldest song, caleb. Sarah, you are the winner. Can you put contact info on your Blogger profile so I can reach you?